When it comes to decorating I'm a big fan of natural finishes - rustic wood, lots of silver, glass, stone, marble, natural fabrics; I tend to avoid veneered surfaces or plastics whenever possible. For that reason I'm a little in love with sisal, seagrass and jute floor coverings. They have a real earthy appeal - simple, natural, a little coastal even. A few months ago, the time finally came to replace our existing carpet on the stairs and landing. I was quietly delighted; I love a good, heavy-duty interior design project! Over the years the carpet we installed there was starting to look a little worse for wear and beginning to fray in places. 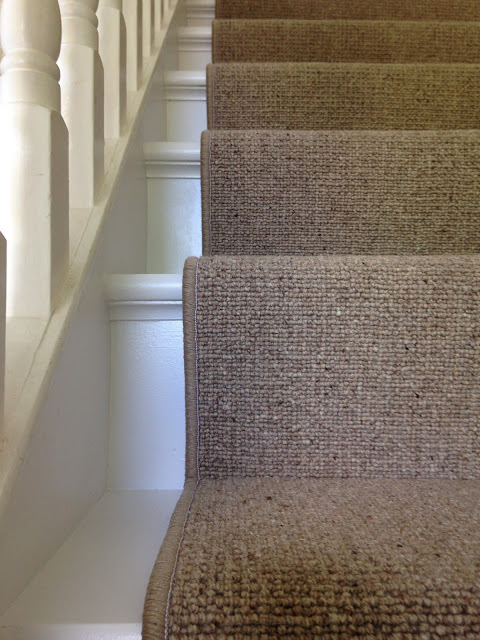 When we first moved into our house we replaced any room that was carpeted (bedrooms and stairs) with sand coloured wool carpets and even though wool is a natural fibre it wasn't my first choice at the time. What I wanted was a plant-fibre carpet like sisal or seagrass, but they were working out too expensive - they cost around 60 - 70 euro per square meter at the time, 10+ years ago. So, I started my search for a new stair carpet to replace the 'replacement' carpet we got when we first moved in. 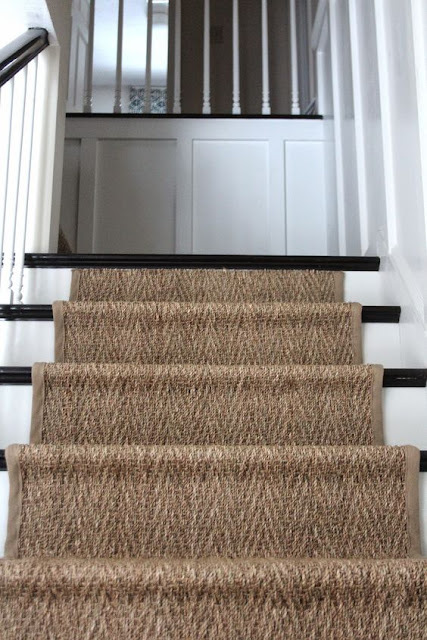 The criteria: A stair runner, which I've always loved but never had, and a natural floor covering made from plant-fibres like jute, seagrass or sisal, which have all come down in price slightly. 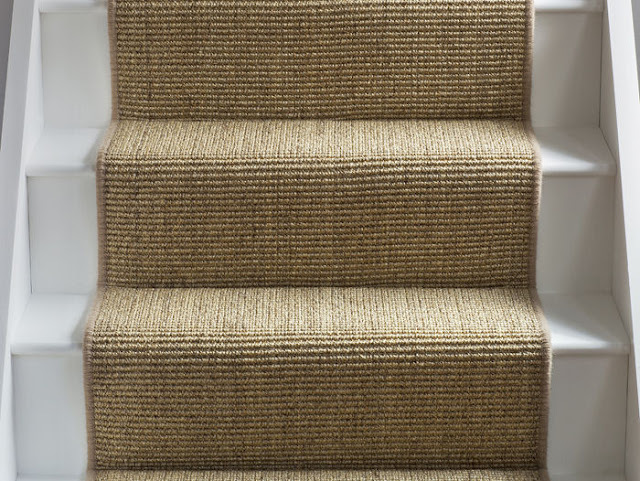 However, every salesperson I spoke to advised against installing sisal, seagrass, or jute on a staircase. I was told that it would be difficult to clean, and certain areas would most likely unravel over time. Like I mentioned, it's pricier than most other carpets and I was also warned that because the texture was quite hard the grip was compromised and as a result the surface could be quite slippy. That was it then, my plan for a gorgeous sisal stair runner went out the window! There was no way I was going to take a chance on a slippy carpet with little ones running up and down the stairs. So, back to the drawing board. 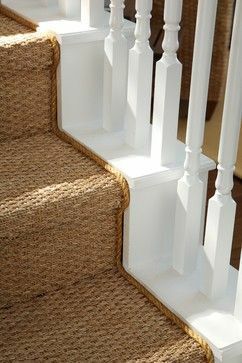 It was Plan B time - either install a different style of carpet entirely or try to get the sisal look without the sisal. I visited A LOT of carpet shops over the course of about a month. And I discovered that carpet shopping is one of the few things in interior design that I do not enjoy! After I decided against installing sisal I had no clear idea of what I wanted which made the task more difficult. I was going back and forth from one style of carpet to another, visiting various carpet shops, bringing home samples, sending emails, getting quotes - it turned out to be a lot more work and a lot less fun than I thought! Then I remembered a place a friend had recommended - Super Value Carpets on the Kylemore road. I had almost picked out a carpet from a place in Walkinstown but the colour wasn't exactly right and the weave was a little too large. In the end, Super Value Carpets was the carpet store that came out on top for me. When I went in I described what I had in mind, I was shown a couple of samples, and I had the exact one picked out in less than 10 minutes! I did bring a couple of samples home with me just to be sure! It's a wool carpet that looks quite similar to sisal but without all the hassle. I spent a long time preparing the stairs before the runner was fitted, but it was worth it! I'm so happy with the new carpet and delighted I decided to get a stair runner - it definitely adds a little touch of luxury to the hallway. But the best bit - we saved around €500 by going with a wool carpet instead of sisal and shopping around. My next post: The time-consuming work that goes into preparing the stairs for a stair runner! Preparing the stairs for painting. Adding a beading detail to the steps. You did a very good job. The only problem is that this carpet is very hard to clean on stairs. Let me give you a tip - to be able to clean well your stairs you can buy a small vacuum for stairs. They are not expensive and you save you a lot of time on cleaning. It's not quite as fast as data recovery software free a connected drive, but has the advantage of being able to access your files from any device, anywhere in the world-as long as you're connected to the Internet. Common misconception about professional carpet cleaning service is it is costly, inconvenient, and one can clean a carpet oneself using self purchased steam cleaning machines or use stain removal products available in DIY shop. For its better cleaning you can hire professionals and rent equipment. You got a really useful blog I have been here reading for about half an hour for stanley steamer fort lauderdale this topic. I am a newbie and your post is valuable for me. In the event that you utilize one of these cover cleaners, ensure that you test it on an unnoticeable region of your cover to guarantee that it won't cause discolouration. The expulsion of the soil and residue particles is the performed by a hand worked vacuum cleaner which is brushed over the zone and expels both the earth and the cleanser particles at the same time. Some online stores will let you register your email with them. You can let them know what item you are looking for and they can let you know when you can get a great home & garden discount deal. Almost every online store runs some type of sale or special all the time.